“The future of Greek and European agriculture in the digital era” was dynamically debated between the 235 delegates of the AgriBusiness 2018, held in Serres, Greece, 1-3 November 2018. 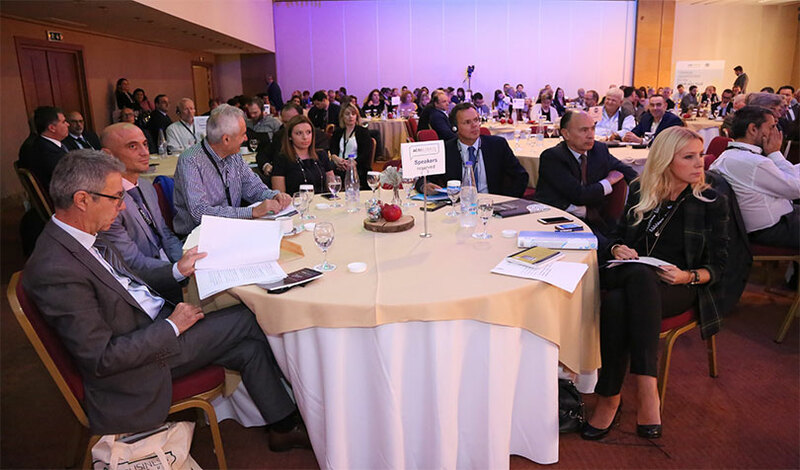 The conference successfully gave floor to agribusiness leaders, from education, science, business and public sector that identified trends, assessed implications and reviewed the resulting challenges and policy options while confronted decision-makers for the near-future Greek agriculture. 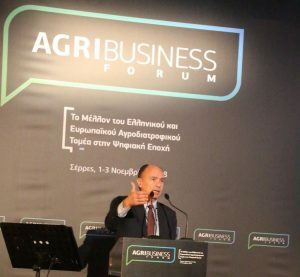 AgriBusiness Forum was attended by 235 delegates from Greece and abroad among which producers, leading and innovative businesses, research and educational institutions, academia, financial services, interlocutors and public sector. 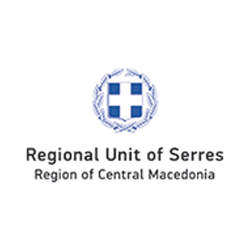 Participants analyzed trends, identified challenges, presented innovative tools and exchanged views on how to modernize through digitization and digital transformation the production, processing and distribution of agricultural products with high added value in Greece and the wider region. 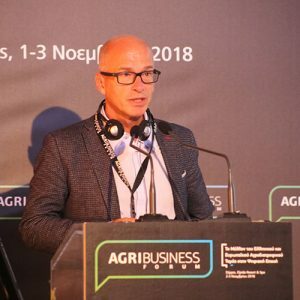 Delegates and media endorsed AgriBusiness Forum as the best ever agtech & agrifood event in Greece thanks to the high quality of speakers, the content-driven sessions and its parallel networking and training activities. 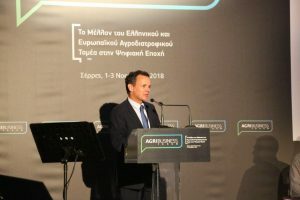 These activities included the Masterclass, a workshop for agri-entrepreneurs, the Hellenic Challenge, a pitch contest with prizes, a field visit provided knowledge on geothermy, as well as ample networking opportunities between leaders and experts in the Greek and European agricultural industry. 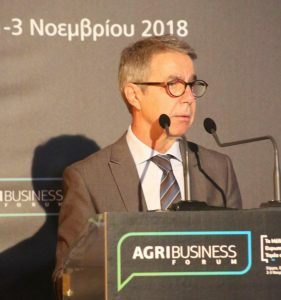 Key message of the AgriBusiness Forum 2018 is the necessity for fast adoption and implementation of cross-sectoral synergies in the agri-food value chain, being the only viable solution for a productive, innovative and sustainable agriculture in Greece. 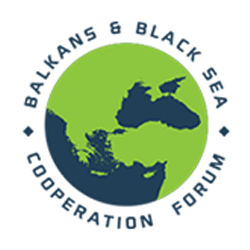 Forum’s seven interactive sessions (CAP in Greece & the EU post-2020, Financial Instruments, New Technologies & AgriDistribution Logistics, Smart Plant Farming, Smart Livestock Farming, Industry & Academia synergies) formed serious building blocks in exchanging and debating information. Consolidating agricultural representation to a single-powerful hub in order addressing the interests and strengthening agri-sector’s messages at national, regional and international level. 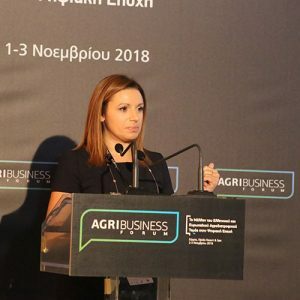 During AgriBusiness Forum 2018, all major banking lenders in Greece (National Bank, Piraeus Bank, Alpha Bank, Eurobank), as well as the European Investment Fund (EIF), the European Bank for Reconstruction & Development (EBRD) and micro-lender MicroSTARS have announced that it will be soon available targeted funding instruments meeting the needs of the local agri-food industry. Networking and integrating partnerships between businesses, sciences and institutions for the improvement of the Greek and European agrifood systems in the digital era. A complimentary Masterclass on entrepreneurship for 10 preselected agri-food scaleups (30/10-1/11/2018), under the auspices and co-organization of the Embassy of the Netherlands in Greece. A Pitching event (Hellenic Challenge) on 1/11/2018 attended by 150 participants. Challenge winner was awarded by the Ambassador of the Netherlands to Greece, H.E. Caspar Veldkamp to participate to a coaching program of Startlife at Wageningen University & Research campus. Second winner was awarded by American Farm School (AFS) to attend a tailor-made course onsite AFS campus in Thessaloniki, Greece. The AgriBusiness Forum on 2-3 November 2018, a dynamic, professional, organic, networking conference focusing on a new generation of entrepreneurship by gathering and connecting the greatest exponents of Greek and European agriculture. A field visit to Nigrita, showcasing its geothermal zone and its agricultural opportunities. High-level partnerships with renowned institutions, inter alia, the Ministry of Rural Development & Food, the US Universities Rutgers New Jersey and A & M Texas, the American Farm School. Auspices and cooperation with the Embassy of the Netherlands in Greece. Co-organization by Geo Routes Cultural Institute, the Regional Unit of Serres and the Serres Chamber of Commerce and Industry. 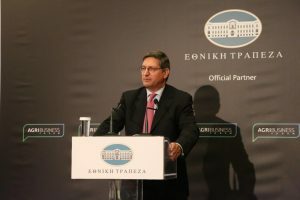 Consortium partner, the National Bank of Greece. 50 distinguished speakers, among which Kassimis DG, Agricultural Policy & European Funds, Ministry of Agriculture and Food, Mr. Haniotis, Director, Strategy, Simplification & Policy Analysis, Directorate General for Agriculture & Rural Development, European Commission, Mr. Geert Wilms, Director of Agricultural Innovation Brabant (LIB) partner of ZLTO farmer’s organization of The Netherlands, business representatives, researchers and academia from Aristotle, Aegean and Thessalia Universities, and professors for USA Rutgers and Sweden Lund Universities. AgriBusiness Forum next edition will be held on 31/10-2/11/2019 and be open to a number of neighbor countries to Greece. 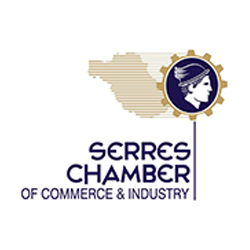 Meanwhile, specific AgriBusiness events will be considered at taking place in other regions across Greece, provided they offer significant footprint or innovation to the agricultural sector.